Posted December 18, 2006 in 2 Fox, 2006/12, Early Jack Kirby, Periods, Serial Posts, z Archive. As some point Jack Kirby began working for Victor Fox, owner of Fox Comics. At Fox Kirby helped to bring to syndication a strip based on one of his comic book features, the Blue Beetle. Normally syndications strips are produced about a week before actual publication. However for a new strip a number of the daily strips would be made ahead of time so that they could be shown to perspective newspaper clients. So while the Blue Beetle strip debuted on January 8, 1940, Jack must have started working for Fox sometime well before that. Jack also did some actual comic book work for Fox that was cover dated as May. Unlike syndication strips, comic book production starts 5 to 6 months before the cover date. This means that Jack must have started at Fox at least by November or December 1939. The Blue Beetle was the last syndication work that Jack did, that is until after the war. By this time he had make great progress in both his writing and his art. Jack keeps the story going well so that each daily strip is interesting and advances the storyline. No longer are there any awkward breaks in the pace like we saw in Lightning and the Lone Rider. The changes to his art were even more impressive, both in his ability to give cast members unique characterizations and in how Jack would compose each panel. However Jack’s handling of action was still rather awkward. Kirby did not stay at Fox Comics long enough to complete the story arc but what is there is fascinating reading. 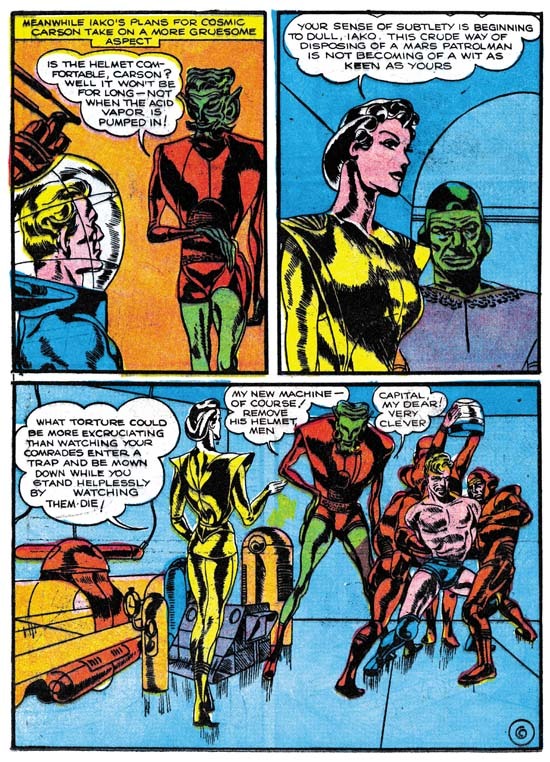 Unfortunately if you want to read the entire strip you cannot use “The Comic Strip Jack Kirby” by Greg Theakston that I mentioned in the last chapter. Although the book claims to have “the complete Blue Beetle” in fact one strip (February 23) is absent as it was replaced with a repeat of January 24. If you really want read the entire strip you have to get the CD version of “The Complete Jack Kirby Volume One 1917-1941” also by Theakston. As I mentioned above, Jack also did some comic book work for Fox which were cover dated May. These two Fox features and one for TEM Publications (covered in my next chapter) were Kirby’s first real comic book work. He must have found in liberating after the years of syndication work. Jack experimented with various sized and shaped panels. The panel layouts could become so complicated that at times he needed to add arrows to direct the reading sequence. One feature Jack worked on was Wing Turner. This was signed as Floyd Kelly, but Jack was not using this as an alias. 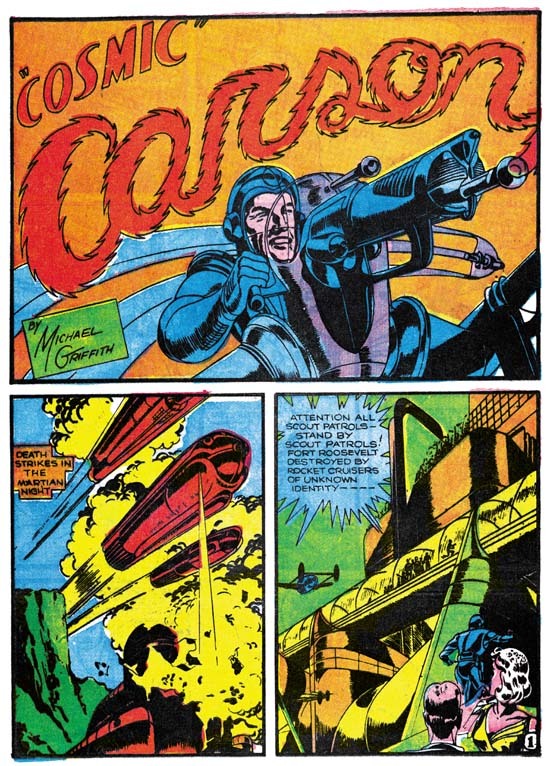 Wing Turner had part of Mystery Men Comics throughout its run. Floyd Kelly was an alias, but it was one for the original artist for this feature. All subsequent artists who worked on this feature, including Jack, were in effect ghosting. Jack’s contribution to Wing Turner is only three pages long. Like a syndication artist, Jack does an interesting story with a great setup for the next month’s installment. But Jack did not return to this feature and another artist continued it, rather poorly. However the issue following that the artist drops the original story line completely. Jack also ghosted as Michael Griffith on Cosmic Carson. I have not seen the earlier installments of this feature, but I be willing to bet they were not as exciting as what Kirby presents. You can tell Jack loves his science fiction. He provides us with a beautiful space pirate, thought controlled “mekkanos”, and an evil giant Martian. Compared to the short Wing Turner, the eight pages for Cosmic Carson must have seemed a lot. But then again Jack preferred to use larger panels, 4 pages have only three panels on them. Jack did the inking for both of these Fox features. With the larger panels, compared to his previous syndication work, Jack was able to use more form spotting on his figures. But we do not find the effective use of large dark areas that Jack used in the Blue Beetle strips. Besides Jack’s comic book debut, cover date May was also significant in that it marked the appearance of Joe Simon as a cover artist. This was not a coincidence. Previously Fox Comics were produced by the Eisner-Iger shop. But this business relation soured and Victor Fox started his own artist bullpen. Joe Simon was hired as editor and Jack got his chance to do comic book features. After May Kirby would do other comic book work, but not for Fox. This is rather odd as Jack’s work was well above that done be other Fox artists of this time period. When the Simon and Kirby collaboration began the work they produced was not for Fox Comics, I suspect Fox paid too poorly. But that is not a complete explanation because the S&K team up began in July. So what happened for June? 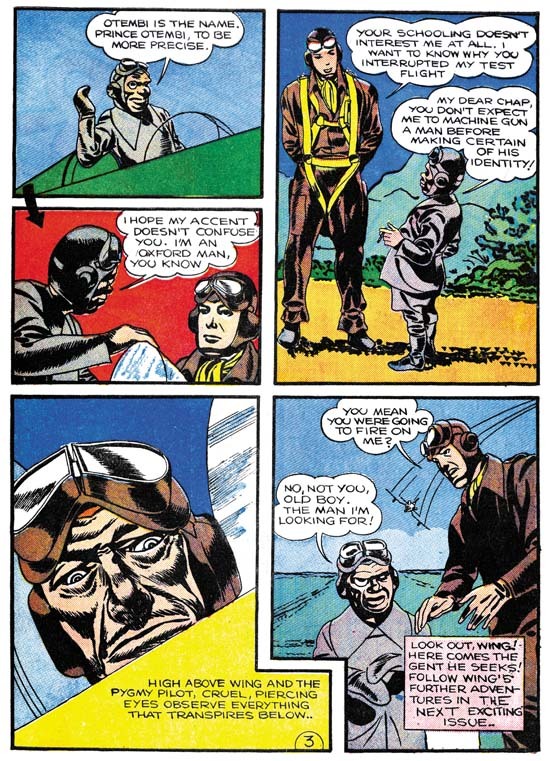 Both Greg Theakston (The Complete Jack Kirby, 1940-1941) and the Jack Kirby Checklist attribute the inking of the Space Smith feature for Fantastic Comics #10 (September 1940) to Jack. Frankly this attribution is rather astonishing to me. The inking in Fantastic #10 is so poor compared to Jack’s work at that time that it is hard to believe he could have been responsible. The splash page for Space Smith is a clear swipe from Kirby’s Cosmic Carson from Science #4 that I show above. To me it is obvious that the artist for Space Smith tried to swipe Kirby’s inking technique as well.